An expanded version of the testimony originally presented by Kirby Jones before the International Trade Commission of the U.S. Department of Commerce. Alamar Associates has convened conferences on various topics, including general business, energy, and travel. Since 1974, Alamar Associates has consulted with hundreds of U.S. corporations, organizations, and media outlets interested in pursuing business in and with Cuba. Alamar offers a full range of consulting services to clients wishing to prepare for entry into the Cuban market. Since December, 2001, several clients of Alamar Associates have signed contracts to sell their agricultural products to Cuba. In 2011, Alamar and its president, Kirby Jones , entered into a strategic partnership with Consensus Inc., a Los Angeles based consulting firm. Working informally with Consensus since 2007, Alamar together with Consensus staff organized a major trade conference on Cuba held in Cancun and Havana, a visit to Cuba by several California agricultural companies, and a People-to-People visit to Cuba by a delegation of members of the Los Angeles Area Chamber of Commerce. Now with this formal arrangement between Alamar and Consensus, Jones is a Strategic Counselor with Consensus Inc. providing consulting services to Consensus clients, organizing trips to Cuba, and providing Cuba related services to a wide range of corporations and organizations. Alamar assists clients wishing to obtain travel licenses from the U.S. Government and arranges visits to Cuba with an agenda tailored to the interest of each client. 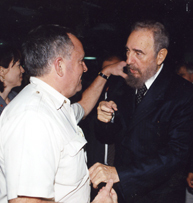 Through its personal relationships with Cuban officials, Alamar can provide counsel, insight, and a road map into the workings of the government of Cuba based on 30 years of first-hand knowledge and personal contacts. "Jones is described by Newsweek as having ' better contacts in Cuba than any other American ' and by The New York Times as ' the man to see about business in Cuba.' "
As reported by the international press, Alamar sponsored the March 2010, US-Cuba Travel Summit in Cancun and the 2006 US-Cuba Energy Summit in Mexico City. Previously, Alamar also organized the October, 2003, U.S.-Cuba Travel Conference held in Cancun, two U.S.-Cuba Business Conferences, as well the 1998-2001 series of five U.S.-Cuba Business Summits, which brought more than 500 U.S. business executives together with Cuban Ministers and sector specialists to discuss potential business opportunities. "With such high level connections, Jones, president of Alamar Associates, a Washington based consulting firm, has become the go-to-middle man for U.S. food producers who want to export to Cuba." Alamar takes the guesswork out of dealing with a government that has largely been shut off by the United States for more than 45 years. We understand it is difficult to know whom to call or what information is required in order to even begin the process of assessing the market potential. Alamar has saved companies time and expense by helping them develop and undertake a targeted approach to doing business in Cuba.